As a parent, it is of vital importance that we spend quality time with our kids, one-on-one. Spending that alone time with our kids is one of the keys to raising well-rounded and well-equipped children. This parent-kid date is beneficial to both sides. Spending that quality time with your kids can increase happiness for both of you and help you to build a bond that will last a lifetime. Not only that, but kids who spend this quality time with their parents are more likely to be successful in school and build relationships with others. This one-on-one attention does not have to be some formal planned-out date. It doesn’t have to really be anything to anyone outside of the two of you. The key is the bonding, which comes through mutual joy and doing something (really, just about anything) together. This past week was a perfect example. Throughout my handful of years as a father, I have made a point to spend quality time with my kids. Sometimes this is just taking the time to play toys with them. We enjoy lunches and dinners together as a family just about every day. But one of my favorite activities are when I get to have that alone time with just one of my kids at a time. When I need to run an errand I will typically bring one of my kids along for the ride. Simple right? To me it’s a small hassle at times, especially with car seats and in the winter, but to them it’s huge. They get to feel just a bit more grown up because they’re running errands or shopping. Plus they get to ride in the car and use our power sliding doors – BONUS! This tradition of bringing a kid along for the ride started with my son, William, since he was older and a little easier to take around town. He’s gotten so used to be called upon for errands, that Alexis has started feeling a little left out. We can’t have that! So it’s my goal now to take her out more, both alone and with her brother. Now that William can handle his own seat belt, this is going to be much easier too! A few days ago as we prepared to have chicken patties for dinner (yum!) we realised we were completely out of ketchup. Now as I’m sure you’re aware, kids in general love condiments and my kids are no exception. Remember the The Mustard Bandit? Don’t worry, this page will still be here when you get back. Go give that a read! Ketchup is a tradition with chicken patties at my house. The kids love it. In fact, I’ve been asked on multiple occasions to put some on a sandwich and then more on the side for dipping. Sometimes they want to dip their sandwich for a little more ketchup-y flavor and sometimes they want to dip completely inappropriate side dishes, like chips or green beans. See what I mean? They LOVE ketchup. I went break the news to Alexis that we didn’t have her precious ketchup, and boy was she sad about that. She sat on the floor in the kitchen sadly and groaned about her lack of ketchup. Wanting to save the day, I said “You know what Lexi, I think we could probably go get some more before dinner is ready” and oh boy did her face light up! She got up excitedly babbling about getting ketchup and how she got to go out to the “ketchup store” with daddy. I honestly didn’t think it was that big of a deal at the time, but she sure didn’t feel that way! We headed over to the door to put on all the winter gear and as I explained to my wife what we were doing, I still felt a bit silly. I mean, it’s ketchup. There’s other things that you can put on chicken patties. But I knew it was a perfect opportunity to get a little alone time to bond with my daughter and that is far more important than any feeling of silliness. I mean, that’s like 90% of what being a father is some days I think. If you’re not being silly with your kids, you’re not speaking their language! So we headed out across the frozen tundra, all half mile of it, to the convenience store up the street. Alexis was joyfully singing about ketchup and daddy in the backseat and I felt like the best daddy in the world. One of my favorite feelings is knowing I made one of my kids or my wife happy. It’s the best. We arrived at the store and the mission began. I tasked Lexi with finding the ketchup and we walked through every aisle – a couple of times. As we walked around we chatted about her toys and her love for ketchup and things we saw throughout the store. Finally we found it and began to make our way to the register. But she spotted something: the drink cooler! 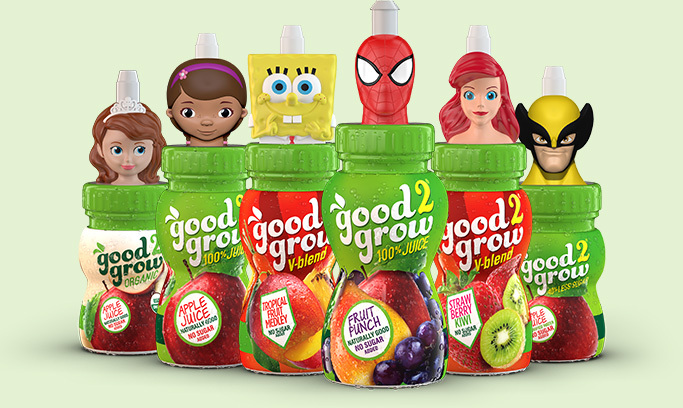 My kids love those Good2Grow juices with the character heads on them and Lexi wanted to find one. After checking all the coolers, twice (because I tend to miss things that are right in front of my face sometimes) we discovered that unfortunately our little convenience store didn’t have any! We ended up grabbing Snapple apple juice for her to share with her brother and she loved that idea. It was right then that I saw a text from my wife asking me to grab a bag of chips. Easy right? Well, I let Lexi pick the chips. She picked some plain chips and while she was doing that I spied two bags of spicy chips I wanted to try. Okay, so now we’re at three bags. Whoops. But when I saw Lexi chose plain chips, I thought that wasn’t enough and grabbed some cheddar and sour cream Ruffles. Four bags of chips, three bottles of Snapple (for me and the wife) and a bottle of ketchup later, we were ready to checkout. So much for just grabbing ketchup. While we waited in line other patrons complimented Lexi’s unicorn hat and she made a couple of friends. When we got to the register, the clerk was handing out candy! So our little ketchup date ended with a sweet treat too. It was great to have that time to spend with my wonderful daughter and I look forward to our next adventure! Making Alone Time is Easy! Remember, alone time with your kids is important but easy to do. This little trip to the “ketchup store” made my daughter’s day and I wouldn’t trade it for anything. What about you? What kind of silly little dates do you take your kids on? How do you make sure you get that quality one-on-one relationship time? Let me know in the comments! Now go out there and be super!